He knows his lines by heart. He knows precisely what to do and when to do it. He has entered into the very personality, the “persona,” of the role assigned to him. And he has dedicated himself to this task so that those who will witness his performance might be mysteriously drawn into it with him. Is this man an actor who brings an audience into a play or opera, or a priest who, by virtue of his ordination, stands in persona Christi (“in the person of Christ”) to lead the faithful in the Eucharist into a greater communion with the Lord in his suffering, death and resurrection? Priestly Fraternity of St. Peter Father Michael Magiera has lived both sides of this question. As a young man in his 30s in the 1980s, he was an international opera singer. 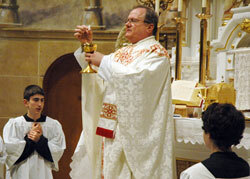 And in 2005, he was ordained a priest for a congregation dedicated to celebrating the traditional Latin Mass. He has served for nearly three years as the associate pastor of Our Lady of the Most Holy Rosary Parish in Indianapolis. Father Magiera has sought to bring the positive aspects of his experience on the stage to bear on his priestly ministry. But it was a long journey for him to arrive at this, his greatest role. Father Magiera’s dedication to his faith was not always as strong as it is now. As a young boy growing up in Philadelphia in the 1950s and early 1960s, he was enchanted with the traditional Latin Mass and desired to be a priest. But then, as a teenager, he witnessed changes to the liturgy in the immediate wake of the Second Vatican Council that were troubling to him. “The twanging, overpowering guitars and drums just made me sick,” he said. “I had gotten really tired of that. Although in his young adult years he said he drifted away from the Church “when the hormonal things kicked in,” Father Magiera says it was the post-Vatican II liturgical changes that were at the root of his abandoning of his faith. His desire for the priesthood, though, was soon replaced by love for music and the stage. After studying music and French as an undergraduate and teaching high school music for a year, he studied voice at Philadelphia’s Academy of Vocal Arts from 1976-79 then studied voice privately in New York. From 1982-87, he was a member of a German traveling opera company and performed as a guest singer on stages across that country as well as in Austria and France. During that time, he was invited to return to Philadelphia to play a role in an opera. His travel expenses and executive suite in a hotel were paid, and he earned $6,000 for his performance. Did he feel he was a star at this point? Within a year of this triumph, he returned to Philadelphia for good, sobered, in part, by the knowledge that he wasn’t going to be the next Luciano Pavarotti. He kept his hand in his art by being a paid singer at various Protestant congregations in his hometown, including St. Clement’s Church, a deeply traditional Episcopal parish that celebrated a liturgy much like the traditional Latin Mass. In the late 1980s, he learned that Catholic Church leaders were allowing the traditional Latin Mass to be celebrated once again. He found his way to churches for these liturgies, came to regret leaving the Church and eventually returned to the faith. Through this reconciliation and a re-discovery of the liturgy of his youth, his long-dormant desires to be a priest resurfaced. Father Magiera became a seminarian for the Priestly Fraternity of St. Peter in 1998, and hasn’t looked back in regret at his old dreams of stardom. In the last decade, he has reflected on how his operatic career and ministry as a priest have, in a sense, been blended. “You are set apart [as a priest], as you are set apart on the operatic stage,” Father Magiera said. “You bring something to life. You bring something that exists on paper or something that exists in the mind of someone. You bring that to life through art. But he also said there are challenges to bringing the two together. “When I was on the stage, I had to train myself to give free rein to emotions that would normally be suppressed in society,” he said. “Now, sometimes, it’s difficult to stifle them because I’ve had so much practice at giving free rein to the emotions. “His beautiful singing voice, his ability to speak in public, and his people skills, sense of humor and ability to organize things well are all now in the service of the Lord and the Church,” said Msgr. Schaedel. Brandon Stanley, a homeschooled 17-year-old, has been an altar server at the traditional Latin Mass at Holy Rosary Parish for a decade. He recalled what it was like to serve for Father Magiera for the first time after he had learned that his new associate pastor had been a professional vocalist. Brandon has a special appreciation for Father Magiera’s vocal talent because they both love music. He has been taking voice lessons for two years, and is a past member of the Indianapolis Children’s Choir. In addition to being an altar server, Brandon has also started to regularly chant the epistle reading at the Sunday celebration of the traditional Latin Mass at Holy Rosary Church. “[Father Magiera] is living proof that you can change drastically, that it’s never really too late,” Brandon said. “He has been able to incorporate one of his largest gifts, which is his voice, into the priesthood. For Father Magiera, sacrificing dreams of fame has been well worth it. He hopes that more young men will consider a possible call to the priesthood.